Last year a friend of mine, Adrian, entered a race called ‘The Lakeland 50’. He completed the race in just over 12 hours – a very respectable time. We started talking and debating if that would be the distance where we’d get similar times. Usually I only run 3 miles but do so pretty quick where as Adrian competes up to marathon distance off road. 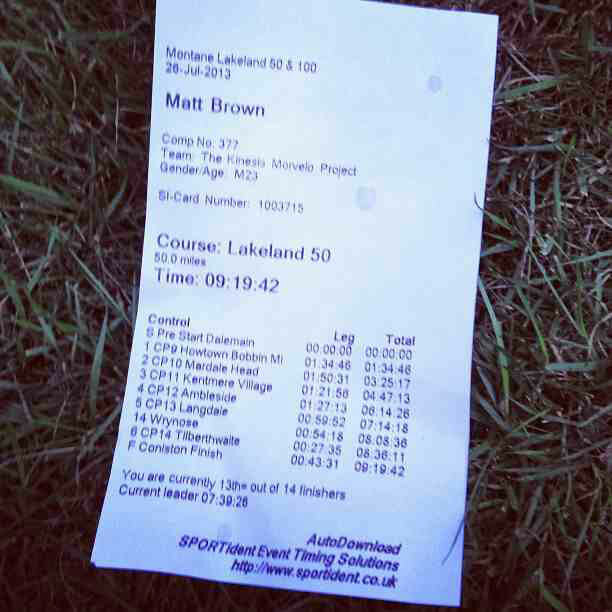 So that was it, I entered the Lakeland 50 as a test to try and beat 12hours. A month after putting my entry in, I rolled my ankle. Pretty badly. It meant i didn’t run for two months and didn’t get back to speed until four months after. It’s still not healed and it slows me down considerably on the descents. I didn’t have a training plan either. the longest race I’d done previous was a ‘trail’ marathon and i suffered towards the end. The months before the race I was travelling around Europe in my van (see #eurotrip) and didn’t get to do too much running, favouring going on the bikes over anything else. I did however have a few long days ‘trekking’ and always used my trailroc 150’s – a shoe with nothing between the rubber outsole and the foot. A good tool for Strengthening the foot! So with two weeks to go, I returned to the UK and started running twice a day – only 3 miles at a time, but at least I was getting some miles in the legs. The weekend before I decided to take my tent and go for a little over nighter at a tarn. The weather was warm and it was a nice quiet night with 2hours running/walking there, and 2hours back. And that was it, all my training for a 50 mile run/race. I’d registered the night before and then travelled home to cook some proper food and have a good nights sleep. The morning of the race was a relaxed start to the day at around 7am to make sure i arrived on time without rushing about. Race briefing was at 8:30am and then we’d have to catch a bus to the start line – half way around the 100 mile course. The bus journey was terrible. If I ever do the race again, I’m not taking the bus. 12 noon came around soon enough and we were off running around a country park estate to make up the 50 mile distance. Everyone was going crazy and sprinting off. I tried my best to hold back and just stayed at a steady pace. I found a rhythm and stuck with it. Soon enough we hit the first check point at 10 miles and after a quick turn around we were off up the first big climb. I’m more of a climbing than a descender or flat runner. At the base of the climb I was 46th. By the next checkpoint I’d gone to 26th. I ended up running with a guy called Jamie. He was good crack and we held a good pace together. We ran together from around 15miles in till the finish. We kept getting faster and stronger the further we went. We were both running on the philosophy of, if we had to walk to the finish, we’d still get under 12 hours. It might not have been true – but the lack of fear kept us going strong. We were catching more and more 50 runners and by Langdale, we’d climbed to 13th place. Only 10 miles to the finish. A 5minute patch of rain, a 5minute confusion about a checkpoint and 5minutes of cramp hit us in those 10 miles. We’d been lucky previously with no major problems. We hit the finish line in Coniston in a time of 9hours 19minutes. We’d kept 13th place. And that was it. A whole 2hours and 50miniutes faster than Adrians time. Experiment over. See ‘kit list’ post for more on what I used. It took me three days to recover enough to get back out running. I entered one of my favourite local races from the North East XC series ‘Nutcracker’ held at Dales Bike Centre in Swaledale. The race goes up, and up, and up. Then down. Repeat four times. This was only my second XC race entered as an expert this year and as there’s less (no) chance of me winning single speed rigid – the stress was off and i was looking forward to a fun race. First lap I was still up with the lead guys and only started to lose them on the biggest climb at the start of the second time round. I was feeling good but taking it steady. My lungs didn’t feel quite right still recovering from the lakeland 50 but it wasn’t holding me back too much. By the start of the fourth lap I had the leader of the expert category in sight. I’d caught him on the first climb and stayed behind him. I was feeling fresh and in mind I wasn’t going to take second. When it levelled off I went onto the right and teased him a little with a short acceleration – he was up for a fight and I heard his gears change and he got out the saddle. I wasn’t ready to go and held off just playing. He kept with me also and didn’t go off wasting all his energy. My tyre had hit a rock and the sidewall had split open. He shouted “do you need a tube?” … I had one ready so he went off into the distance while i took off the back wheel and tried to fit the new tube. I set off ready for the descent to the finish – and then another expert rider past. Instead of a chance of the win, I’d ended up third … there were only three expert riders. I’m really getting sick of tyres now. I’ve never had punctures before – and then I go and slice open the sidewalls four times in one summer. I had to do it. I ordered one of the new Kinesis Sync frames. It’s titanium and the small size which I’m building has 650b wheels. It’s been playing on my mind recently and now how my rides are changing to more big mountain I couldn’t help thinking the smaller wheels will help with chucking myself down mountain sides. Only time will tell. One thing is for certain, it is going to be one hell of a nice looking bike. Keep looking on instagram.com/singlespeedmatt for more updates. great blog Matt. Enjoyed reading it. Well done! How were the trailroc 150′s on such a long run? I’ve done 30 mins in Merrell Trail Gloves and use Brooks Pure Grits for local (southern) trails. I’m after some new fell shoes after my Salomons destroyed my heels (you should have seen the looks on people’s faces!) at SLMM this year.